This residence was designed in 1928 by the renowned architect Paul Revere Williams for Victor H. Rossetti and his wife, Irene A. Rossetti, in the Spanish Colonial Revival style. Victor Rossetti was Vice-President of Farmers and Merchants Bank at the time of the building of the house. In 1931, he became the bank’s president and held that position until 1956, when his bank merged with Security First National Bank, and Rossetti retired. Rossetti was an important force in financial circles for many years, frequently authoring columns in which he predicted the financial direction of the nation and counselled a course of conservative spending on the part of the government at all levels. Rossetti lived in the house from 1928 until 1950, after which he moved to San Marino. Paul R. Williams designed the house and garage and was retained a second time in 1937 to design a porch addition. The site is important as the home of an influential banker in Southern California, as well as being the work of the master designer, Paul R. Williams. 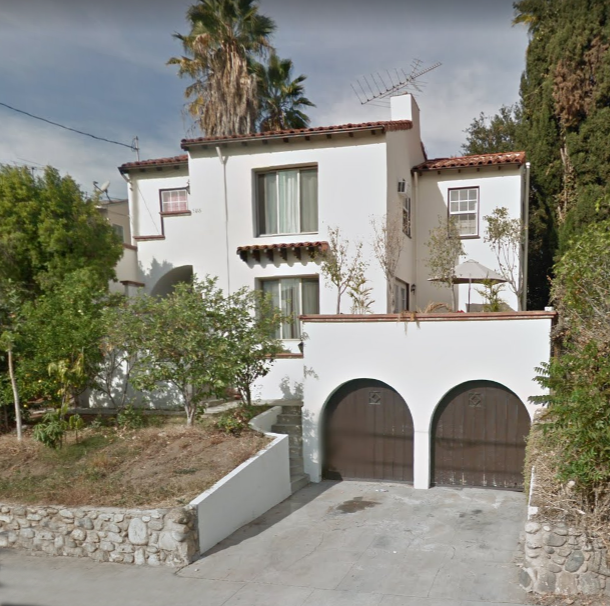 It is also an excellent example of a large Spanish Colonial Revival House from the 1920s. Paul Revere Williams was one of the premier architects of mid-20th Century Los Angeles. His homes were each unique and well suited for their sites. Williams, who was the first African American architect to be elected as a fellow of the American Institute of Architects, was responsible for the designs of the homes of much of the area’s rich and famous, yet he also did work for many lesser heeled clients, as well. The Victor Rossetti Residence is significant to his early career as an example of his residential work on hillsides as well as an important example of Spanish Colonial Revival architecture. The style began its use in Southern California around the time of World War I as an advancement on the earlier Mission Revival Style. Both styles have their roots in the early Spanish-Mexican history of the Southwest and became popular as many new residents as well as more established ones, sought a California lifestyle that reflected the area’s romantic past. Victor Rossetti was born in Virginia City, NV on February 19, 1871 to Italian-Swiss immigrant parents. He married Irene. Silvestrihad in 1906 and had a daughter, Eleanor, and a son, Victor, Jr. The family relocated to San Francisco and Rossetti took a job as an office boy for Wells Fargo Bank in 1893. After advancing to assistant cashier, he relocated to Los Angeles in 1911 to become the cashier of Farmers and Merchants Bank. He was elected Vice President of that bank in 1917 and became the President in 1931. Over the next 25 years, he remained in that position, maintained a high profile in the financial community and the public eye through periodic opinion pieces in the Los Angeles Times and other publications. His advice was conservative, especially in the area of government spending, especially when it involved a deficit, which he believed to be an invitation for runaway inflation. Rossetti’s wife passed away in 1947 and he sold the house in 1950, when he moved to San Marino. He stepped down from the Bank Presidency in 1956, when Farmer’s and Merchant’s Bank merged with Security First National Bank. Victor Rossetti passed away on November 19, 1960 at the age of 83.